The physicians at DFW Center for Spinal Disorders are spine specialists first and spine surgeons second. They take a multidisciplinary approach to back pain, providing the highest quality spine care possible. The doctors provide compassionate treatment for back and neck pain, bulging discs, compressed nerves, scoliosis, sciatica and degenerative disc disease. The doctors manage spine problems by pinpointing the source of the pain and prepare treatment plans that address patients’ specific issues. Treatment options include exercise, anti-inflammatories, physical therapy, pain management, disc replacement, minimally-invasive fusion and decompressive spinal procedures such as laminectomy, discectomy and foraminotomy. Most back pain issues can be resolved by nonsurgical means, but when those treatments are not effective for pain management, the expert doctors at DFW Center for Spinal Disorders will provide compassionate, patient-centered surgical care. Approximately 10 percent of their patients require surgery. The physicians also strive to integrate prevention plans for immediate or chronic problems to help alleviate possible future difficulties. 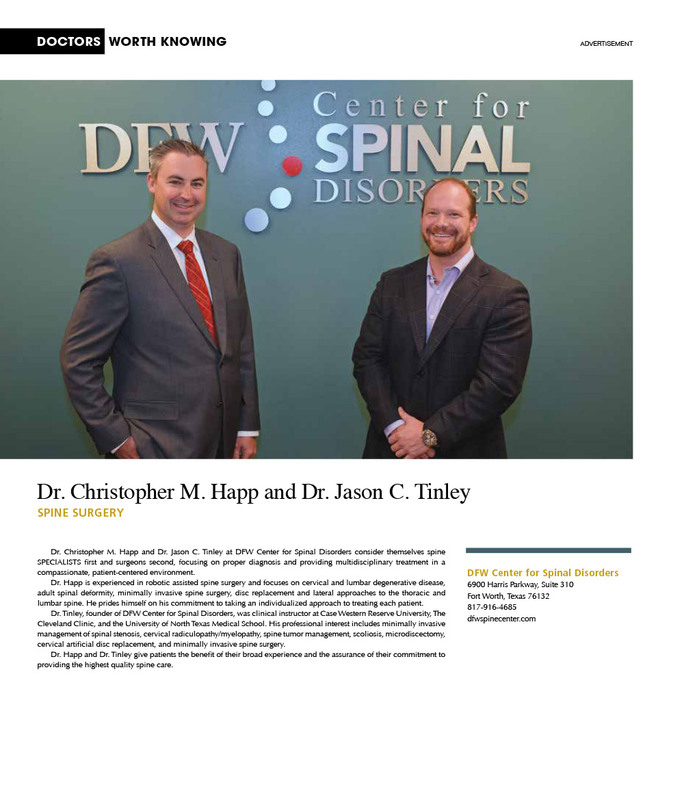 DFW Center for Spinal Disorders has offices conveniently located in Fort Worth, Euless, Arlington, Southlake, Alliance, Flower Mound, Plano, Irving, Weatherford, Burleson and Las Colinas. Call today to learn about treatment options for lower back pain. B.S., Loyola University, Chicago. D.O., Chicago College of Osteopathic Medicine. Internship and residency, Midwestern University, Chicago. Fellowship, orthopedic spine surgery, The Texas Back Institute, Plano, Texas. Member, North American Spine Society. B.S., B.B.A., Presbyterian College. M.D., Medical College of Georgia. Orthopedic residency, John Peter Smith Hospital, Fort Worth, Texas. H.H. Bohlman Spinal Surgery fellowship, Cleveland, Ohio. Teaching staff, Case Western Reserve University, The Cleveland Clinic. Member, North American Spine Society.